A complete solution to the challenges of Health Centre, polyclinic and specialist medical centre management. This is an information system made up of various modules which, combined together, provide a complete solution to your centre’s challenges. 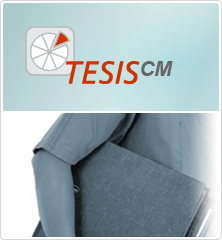 Implementing TESIS CM will enable you to set up agendas and schedules, prepare patient reports, a patient’s case history, issue invoices, as well as create statistics on the clinic’s economic and health care activities. • Multiple schedules may be defined. • Schedules from various clinics can be aligned. • Visits and tests can be programmed. • Generation of task lists.? It allows the all different types of invoice the clinic may require to be generated. All costs are automatically assigned to the patient the moment the health treatment is programmed or performed. • Records items to be invoiced. • Issues invoices to individuals or companies. • Configuration of insurance cover plans. • Settlement and issuing of doctors’ fees invoices. • Transfer of accounting records.? Generates statistics on activities relating to both administration and health care provision. • Specification of a time period for the activity. • Possibility to select the criteria governing data distribution and the indicators to be displayed. • The information may be displayed in data format or graphically. • Ability to export the selected data to Excel format. • Allows consultations to be stored for future use. Allows access to the case history created from the notes recorded manually by the doctors and medical staff, and other sources automatically generated from the data exchange with other modules in the application. This product consolidates all the patient’s information so that hospital staff need only work with one Workstation in order to be able to offer all the health care the patient needs. • Manually records the notes considered to be part of the case history, with options such as: font type, letter size, tabs, copy/paste, etc. • Allows a particular report to be attached (image, scanned document). • The System associates the entry with the treatment the patient is currently receiving. • It also automatically feeds from the information generated by other modules. • Notes may be viewed by: Treatment, Service, Type of Note, Type of Case History, etc. • It is possible to choose the number of notes to be viewed or select a period between two dates, and, under certain circumstances, a note may be modified or cancelled. Reports provides access to all the documents associated with a medical record, classified according to their type. • It allows users to define Word templates which the doctors may use to create their reports. • Each template is associated with a report “Type” and “Model”, making the classification of the report simpler. • It is possible to specify the number of reports needed. • After selecting the report to be written, and having specified the patient and the kind of treatment to be given, the chosen template opens up, automatically filling in all the information that can be obtained from the database. • Once the report has been created it is possible to View, Modify, Close, Delete, Clone and Edit it. • Improves and streamlines the administrative and health care services. • Complies with the Personal Data Protection Law requirements. • The treatments are automatically charged to Invoicing. • Aids processing and tracking of insurance company authorisations. • Improves and guarantees a high quality of health care.